We are a leading Manufacturer of spur gears, spur gear for paper mill and cast steel spur gear from Patiala, India. Finding its application in a number of industries, the offered Spur Gears are known to be amongst the finest that is available in the market. Manufacturing of this range is done in compliance with the set industry norms and guidelines, utilizing the finest raw materials and modern technology, ensuring its resistance to corrosion, durability, dimensional accuracy and performance. Mostly spur gears manufactured by us are used in gear boxes machines, mining equipments, material handling equipments and gear pump units. 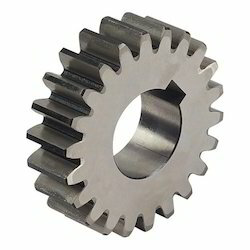 Spur gears are connected with parallel shafts which makes teeth parallel to the shaft with internal or external teeth. 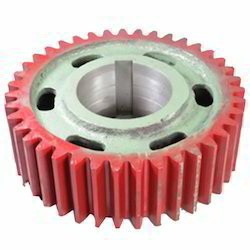 They are more economical in terms of manufacturing when compared to other types of gears and thus we can provide you spur gears at low cost but giving satisfactory performances. 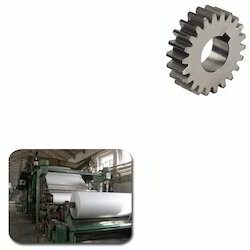 We are engaged in offering of Spur Gear for Paper Mill which are extensively used in paper mill, These offered products are highly demanded in market. We offer our products in market at minimum cost. With its superior dimensional accuracy, sturdiness, durability and resistance to corrosion, the offered range of Cast Iron Spur Gear is known to be one of the primary preferences in the market. Manufactured in compliance with the set industry norms and guidelines, its quality never deteriorates. In addition, the offered range is marked t the most reasonable rate possible. Looking for Spur Gear ?